72 Volunteers headed out into Moreton Bay to clean Green Island. They removed a whopping 660kg in one morning. For more photos visit the Facebook events page or read our write up here. 26 people gathered at the Dog Beach at the mouth of Stumers Creek on a windy day and collected 112kg. Most impressive was the turn out by the young ones with young families bring their kids down to get involved. 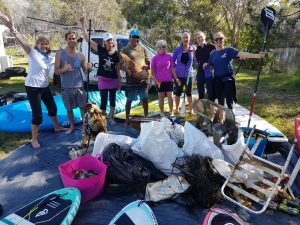 18 Paddlers cleaned up Upper Stumers Creek in Coolum removing 107kg of debris. Hideaway Handmade is run by Around Australia World Record Holder Bruce Arms who broke our founders solo record set in 2010. 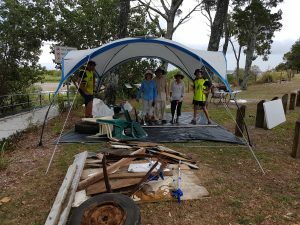 Courtesy of this sponsorship we were able to run a clean up in Wurtulla on the Sunshine Coast. For more details on the event, visit the Sunshine Coast Daily write up. 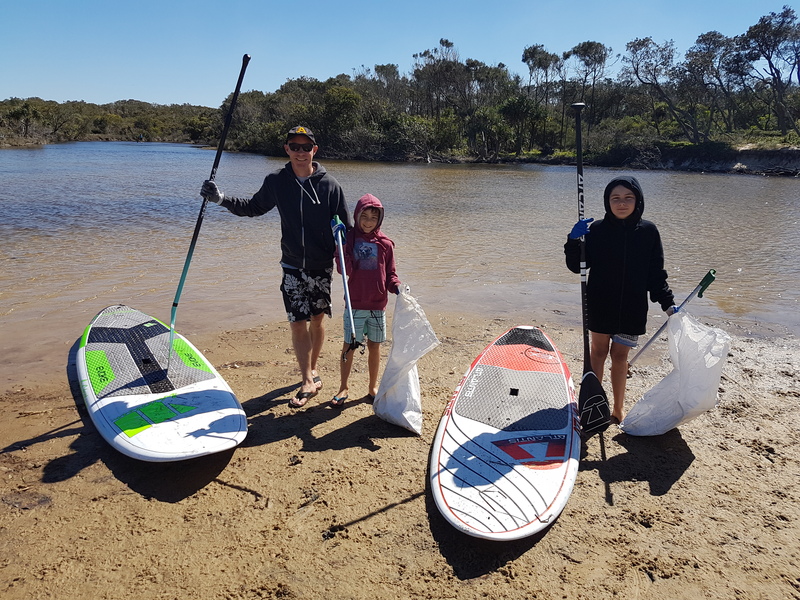 Courtesy of a community grant from the Moreton Bay Regional Council, we were able to conduct 2 clean ups at Hays Inlet over summer. The location for our clean ups was chosen as Hays Inlet is a vital fish breeding ground for Moreton Bay. Two drains run past RJ Frawley Reserve into the mangroves that surround Hays Inlet. Over the two days we found an alarming trend that McDonald’s, located at the start of the drain system was providing a staggering 10% of the debris collected. We also noted surrounding businesses didn’t have adequate protection on their back fences with large amounts of items coming through the fence into the drainage system and effectively into Hays Inlet. We passed this information onto the council and they visited these businesses and told them to find ways to reduce, if not eliminate the amount of debris coming from them. 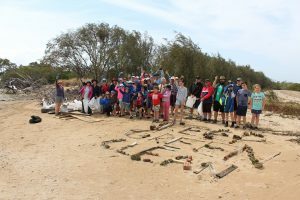 Whilst it was hot work, the small teams did a wonderful job removing 108.4kg of debris which was made up of 5,044 individual items. 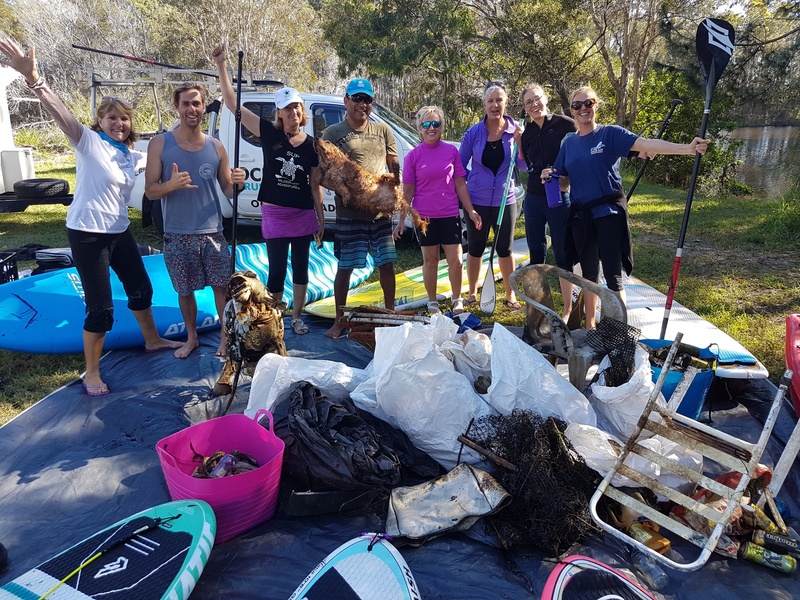 Over 4 days this summer, dedicated locals and the team from Ocean Crusaders visited Buckley’s Hole and Red Beach on Bribie Island to conduct clean ups as part of a community grant from Moreton Bay Regional Council. Buckley’s Hole is a bird sanctuary located on the South West tip of Bribie Island. Unfortunately that means a lot of debris from Moreton Bay is blown up on the beaches here and big tides meant it washes into the wet lands where birds frequent. The majority of the debris in Buckley’s Hole seemed to be boat timbers and items from people having parties, whilst Red Beach sand dunes consisted predominantly of party items like chairs and bottles. A total of 470.8kg of debris was removed over the 4 days consisting of 3,251 individual items. In 2015/16, Founder Ian Thomson and his wife Annika sailed from Croatia back to Australia visiting many schools and villages. The journey started in July 2015 in a little place called Grabastica in Croatia and took in the Mediterannean, Canary Islands, a crossing of the Atlantic landing in Barbados before a transit of the Panama Canal into the Pacific. Christmas and New Years was taken in at the lengendary Galapagos Islands before an amazing time in the South Pacific. 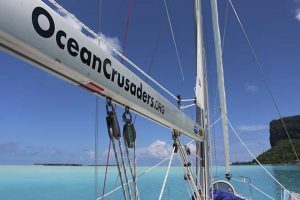 We met amazing people and were able to educate so many people along the way, from the wonderful students of island schools to the many sailors we had a chance to share our adventures with. 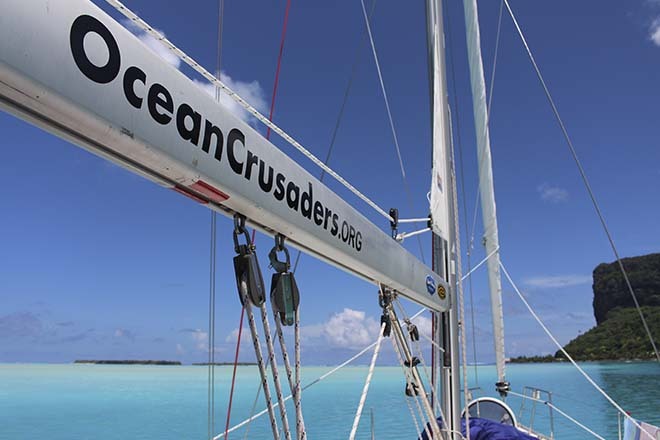 To read more on this 10 month journey visit the Plastic in the Pacific Pages. In Nov/Dec 2014 and again in May 2015 we visited Essignton School in Darwin. 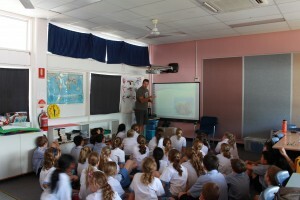 On the first visit we taught levels 2 through to 5 of the issues our oceans are facing in general. When asked to return in 2015 we taught our turtle lesson. Mr Bannantyne’s class even changed their assembly item to focus on marine debris and their research came up with a crocodile found with 25 bags in its stomach. Ian Thomson, the founder of Ocean Crusaders Pty Ltd., visited Seaford North Primary School recently. He told us the damage that plastic bags can do to aquatic life. It was quite sad to see the pictures of animals that have eaten plastic bags. 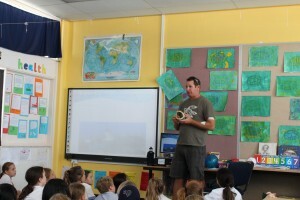 Ian is visiting schools to raise awareness of the huge problem of plastic bags and other rubbish clogging up our oceans. His presentation was entertaining and enlightening. Ian showed a PowerPoint presentation highlighting the issue and answered questions from students. The hour long presentation was inspirational. We discussed the issue in our classroom and spent a couple of hours researching further information and making posters, designing logos and writing letters. We now know that as individuals and as a group we can make a difference to the way we view this issue. We can stop using plastic bags and reduce, reuse and recycle. We thoroughly recommend that all schools invite Ian to talk to students about this important issue. One of our members was approached by a primary school student by the name of Hannah. Hannah wanted to support the cause in her school. She is now conducting school talks in her region and running a competition at her own school where students have been requested to make a costume or piece of artwork out of plastic rubbish. It is inspirational when young people have this much drive to make a change. During the Whitsundays Reef Festival we were heavily involved in the Recyclable regatta. It used to be the beer can regatta however with our campaign, organisers opted for a plastic bottle recycling regatta. We joined forces with the Whitsunday PCYC and we collected 600+ 2L milk cartons in just 6 days. We built our raft and then had our launching as seen in the video below. On the 23rd Oct we raced against other projects and came home 2nd overall, a fantastic effort. The aim was to educate our youth on recycling plastics. After the race, our raft, along with all the rafts were sent off for recycling. 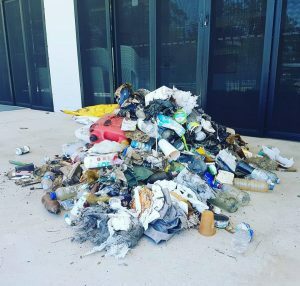 Judging by 600+ bottles in just 6 days, there needs to be recycling in the Whitsundays so we will begin a campaign for that using this event. In Florida to create awareness we competed in the dragon boat races and we had a victory. In January 2011, we ran a program with the Whitsunday PCYC to educate youth on their backyard. We started with a day at the Whitsunday Sailing Club with Roger who taught the students how to sail. This was followed up by a day on Another Fiasco, one of the Whitsundays fastest racing yachts. The following day the students learnt to dive and then a trip to the outer Barrier Reef courtesy of our sponsors Cruise Whitsundays. The final day of the program was a talk by founder Ian Thomson to educate the students on why we need to care for our oceans.